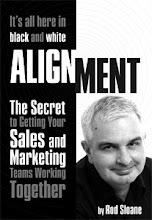 Sales and Marketing Alignment Blog from Rod Sloane: Stop Trying to be Liked! Your job is not to be liked! Your job and role is to serve your constituency by spreading ideas to them that they find useful and practical through your products and services. It takes a pretty immature attitude to need to be liked. Have something of value to offer and go promote it. Now, I'm not suggesting you be obnoxious or rude, and it's OK with being likeable, but please don't lead with your needs. Lead with your constituency's needs. And stop talking about your family. I don't care!